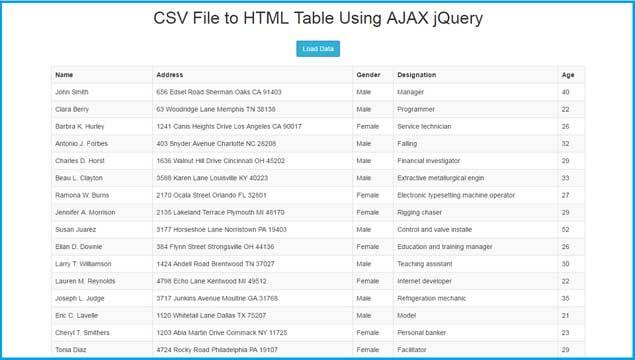 This is the simple web tutorial in which We are going to learn how to import CSV file into HTML table by using Jquery Ajax method. In simple words we will parse CSV file data and display into HTML table format on web page by using Ajax JQuery method. Here We will not use any JQuery plugin or library for read CSV file and display CSV file data in HTML table. We all know CSV stands for Comma Separated Values file format and in this we have store data in string format which are separated by comma. This format file we can also open excel also so it is widely used for exchange data between application. Here we have perform all operation at client side, so no load has been come on our server. By using this script we can load large number of data from CSV file to HTML table. This type of feature is very useful if you have build some large project in which if you want to reduce load on database server, then you have so load some data from CSV file, so it will reduce some on database server. So, this our simple tutorial in which we have display CSV file in HTML Table on web page. what must modify if employee_data is on Cyrillic? Show me broken signs. I add meta charset=UTF-8 in HEAD tag but not working on table. it shows me "NetworkError when attempting to fetch resource"
Hi! Thank you for your great tutorial. This is really usefull for me. In my csv file I have a first column "location". Is it possible to only show the rows where the first row has a specific value? How could I do this? How to handle double quotes ("") and coma (,).. For example if my value is "Jack,Jones" I want everything between ("") to be under one column and not to break.